I began my DJ career playing 1200 capacity student and club nights, and underground house nights, in Nottingham. Then I moved to Cambridge and began running my own highly successful club nights, which I regularly took to the Alps. When 70s disco phenomenon Carwash went on their UK tour, I played on the Cambridge leg. I have also headlined at the Bug Bar in Brixton, legendary home of The Basement Jaxx, on regular rotation with Milo Speedwagon and Dave Stelfox. In Prague, I was asked to headline at the Roxy, their top underground club, and I have DJd after Judge Jules to over 1000 people at the Complex in London. I am the regular DJ for Brighton Fringe Festival events, England’s largest fringe festival, and have played on the main stage at the Strawberry Fair Festival, Cambridge, which attracts crowds of up to 70,000. 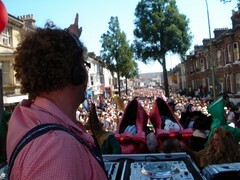 In 2007, I was asked by Barclays Bank to DJ on their float at Brighton’s Gay Pride Parade. This was the last float in the procession, attracting up to 150,000 revellers to dance along following the parade – that’s the photo above. The procession lasts for five hours and culminates in a huge party in one of Brighton’s parks. It was amazing!